Kasaragod/Kasargod is a religiously important tourist attraction in Kerala. Read the article to know more about Kasargod and its tourist sites. Kasaragod, the northernmost district of Kerala, is home to a number of tourist attractions of the state. Nature has splattered its bountiful beauty throughout Kasargod, with as many as twelve rivers flowing across its terrain and Arabian Sea in the west. The eastern region of the district is covered with the lush green woods of Western Ghats. Kasaragod has several enchanting things to offer to its visitors. These offerings include beaches, temples with architectural magnificence, and mosques and churches of historical importance. People in Kasargod belong to different communities and speak different languages. The prominent languages spoken in Kasaragod are Malayalam, Beary, Tulu, Kannada, Marathi, Konkani and Urdu. The district is famous for its handloom and coir industries. People here have adopted fishing as their chief source of livelihood. Bakel Fort is situated 26 km away from Kasargod. This magnificent fort is nearly 300 years old and is among the most popular forts in Kerala. In its efforts to increase tourism in the state, government is looking forward to develop Bakel Fort and the adjacent beach into a special tourist destination. From this majestic fort, tourist can see the beautiful Arabian Sea and beach. The fort was Constructed by the Ikkeri Naikkanas in the 17th century. Numerous events of war and siege have taken place within the premises of Bakel Fort, making it a significant monument in the history of Kerala. Even after three centuries, this architectural marvel still stands with its regal elegance and glory. Ananthapura Lake Temple is a prominent tourist attraction of Kasaragod, because it is the only lake temple in the entire state of Kerala. 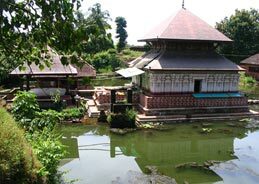 This fine lake temple is located at Kumbala, 12 km North East of Kasargod. The significance of the temple can be evident from the fact that it is believed to be the ‘Moolasthanam’ (place of origin) of Sree Anantha Padmanabhan, the presiding deity of Sri Padmanabhaswamy Temple of Thiruvananthapuram. The annual festival of Ananthapura Lake Temple falls on the second fortnight of April. Initially dedicated to Lord Shiva, Madhur Srimad Anantheshwara Vinayaka Temple is located 8 km North East of Kasargod. Even though Srimad Anantheswara is the presiding deity in temple, the deity of Lord Ganesha is mainly worshipped here. The fine architecture of the temple includes its impressive structure adorned by turrets, gables and copper plate rising. The temple is surrounded by the beautiful landscape of lush green paddy fields and the river Madhuvahini that flows in front of it. Located at Thalangara, Malik Dinar Mosque is believed to be established by Malik Ibn Dinar, who constructed this monument with the aim of spreading Islam in India. Also known as Juma Masjid, this mosque contains the remains of Malik Ibn Mohammed, who was one of the followers of Malik Ibn Dinar. This place is religiously important for Muslims. Every year, thousands of pilgrims flock here for the Uroose Festival. Also known as Our Lady of Sorrows Church, Bela Church is located 15 km north of Kasaragod. This Roman Catholic Church was built in 1890, which makes it the oldest church in the entire district. Pallikere Beach is famous for its clean and shallow water, which is ideal for a comforting stroll. It provides safe swimming for children. The beach is adjacent to Bekal Fort and offers various striking views of the historical monument. Mangalore International Airport in Karnataka is the nearest airport, situated at a distance of 50 km from the Kasargod. Kasargod Railway Station connects the city with other major cities of the state. Kasargod has a well connected network of roads that connect it to other cities in Kerala as well as a number of cities in the neighboring state of Karnataka. NH 17 is the national highway passing through the district.